WHEN: Sunday, April 7, 2019, at 2 PM. WHERE: The Jewish Heritage Museum located in the Mounts Corner Shopping Center, at 310 Mounts Corner Drive Freehold, NJ, at the corner of Route 537 and Wemrock Road (between the CentraState Medical Center and Freehold Raceway Mall). It is on the second floor of the historic Levi Solomon Barn. For more information or to make a paid reservation (non-refundable), call the Museum at 732-252-6990, or visit www.jhmomc.orgjhmomc.org. Maximum capacity is 100, so paid reservations are recommended. Storytelling is a timeless skill through which we can find truth and understanding. 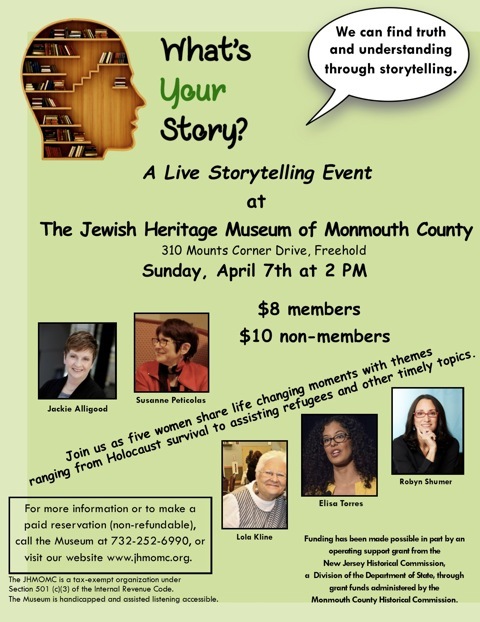 At this event, coordinated by Robyn Shumer, a storytelling coach and storyteller in her own right, some of Robyn’s proteges will share stories of life changing events. Speakers include Museum volunteer Lola Kline who will reveal the story of survival of her family during the Second World War. Other speakers include Susanne Peticolas, who speaks about assisting refugees; Jackie Allgood who survived several cancer diagnoses; Elisa Torres who talks about human trafficking; and Robyn Shumer’s talk of overcoming obstacles to become a mother. What’s Your Story? is a storytelling initiative that resulted from a call to action from founder Robyn Shumer. In her TEDx talk, Robyn reflected on her own personal experiences and recognized a simple truth: we can find truth and understanding through sharing our unique experiences and stories. Unfortunately, many of these stories go untold. “What’s Your Story?” is a storytelling initiative that challenges us to open up to others and generate lasting, meaningful, personal and social change, with the mission to provide safe spaces for people to tell the stories that shape their lives. Proceeds from every event goes to non-profit organizations. For more information, visit www.wysusa.com.